Midas Well has spent his career thus far drawing inspiration from a multi-faceted assortment of styles ranging from gospel and folk to hip hop and metal. He pulls deeply felt inspiration from the sublime talents of artists such as Stevie Wonder, Michael Buble, Michael Jackson, Macy Gray, and George Clinton. The highly anticipated release of his debut album “Golden Rule” will imprint his own distinctive mark on the future of urban music. “Golden Rule” is a visionary project, fusing together sultry melodies and a dulcet tongue. 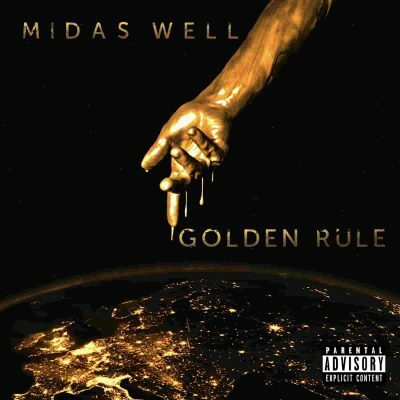 Midas’ artistry brings a rawness to his music that is rarely seen. The album was executive produced by Noah Fendz, alongside producer Dielog. Midas Well spent the earlier part of his career conning record labels. Using his obvious talent, he’d get them to sign him, claim he had cancer, take the advance and run. After burning through performing with an extensive list of bands in an almost equally long list of genres, he toured the country with a metal band. Midas signed to a major indie label and enjoyed moderate success, then left the heavy metal world to pursue a solo career with Jurnt. Midas found his passion for inventive songwriting and putting the full force of his vocal prowess behind it. Since joining the collective of Jurnt Entertainment in 2015, he has worked hard to pursue his vision as an artist. His passionate and mature sound proves he belongs in the front of the line in this next turn of rising urban artists. Midas Well is a singer, songwriter, and multi-instrumentalist currently residing in Austin, Texas. “Golden Rule” is coming soon to all streaming platforms and CD/vinyl, from Jurnt Entertainment. You can follow Midas Well on Instagram or visit his website for more information.